From the start of my natural hair journey, my favourite protective style has always been box braids. Especially in the summer when I’m on my holiday break, box braids are definitely my go-to style. They’re a great way to protect your strands, help with growth and of course gives you more time in the morning/evening. Come on, who wants to waste time detangling, twisting and styling when they’ve got a holiday to enjoy. Not me that’s who. Braiding has many benefits but lets not forget about the downsides to this protective style. Braids can cause damage, breakage and in some cases alopecia. To avoid making the common mistakes, so many women make when wearing braids. I’ve listed some helpful tips on getting the most out of you style. 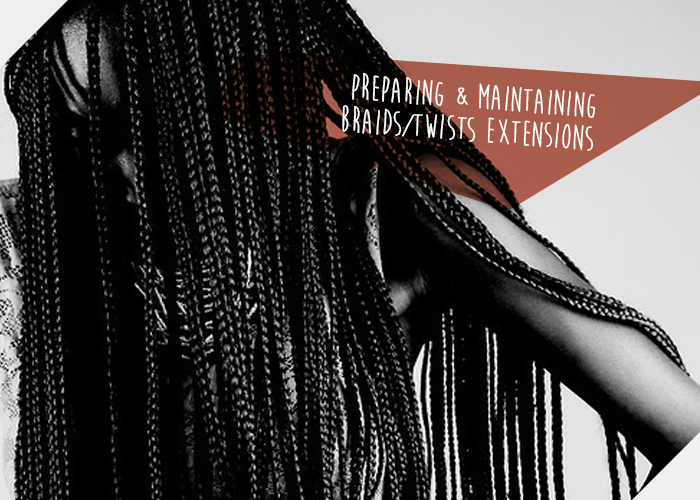 Before you consider installing braids/twist extensions, please ensure that your hair and scalp are healthy enough to handle the extra weight and tension from the braids. In preparation I would suggest doing a protein treatment followed by a moisturising deep condition, at least twice before installing your braids/twists. It’s also important to solve any scalp issues such as dryness, dandruff, itchy scalp, any fungal infections etc. These may weaken your hair and lead to damage and breakage. Please don’t forget that the hair underneath your braids still needs love and attention. The same way that you moisturise your hair when they’re out, you need to ensure that your hair is moisturised whilst in your braids. To keep your hair from getting too dry, use a liquid moisturiser or braid spray twice a day. I tend to use my homemade moisturiser spritz, as it’s a great way of penetrating the braids and getting to my actual hair. It also helps to prevent build up on my braids, especially at the root. Find a plastic container/jar, add your favourite shampoo then some water until it’s watery enough for easy application. Within each section, apply the diluted shampoo to you scalp and rub gently to lift the dirt from your scalp. Make sure you use your finger tips and NOT your nails. Pour the remaining diluted shampoo over your head and squeeze your braids to ensure that the shampoo penetrates and cleans your hair inside. Once done run your head under the water until it rinses clean. Apply your leave-in conditioner of choice. Alternatively if you feel your hair needs extra moisture you could use your conditioner/deep conditioner. 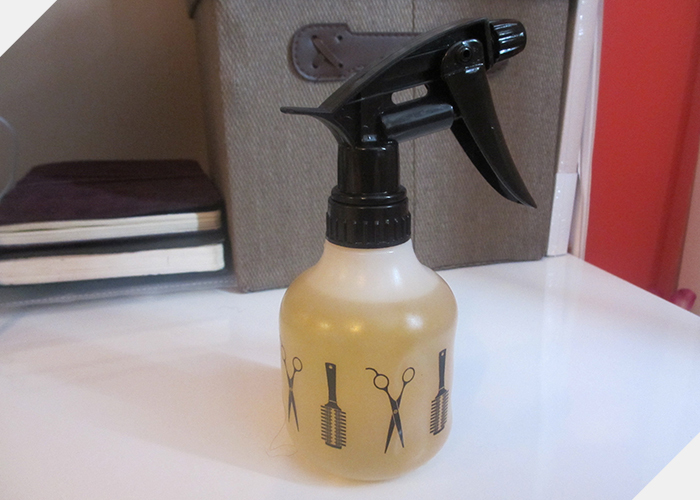 Use the same method as the shampoo and mix your conditioner with water in a plastic container/jar. Rinse thoroughly as conditioners/deep conditioners tend to be thick and could cause build-up. 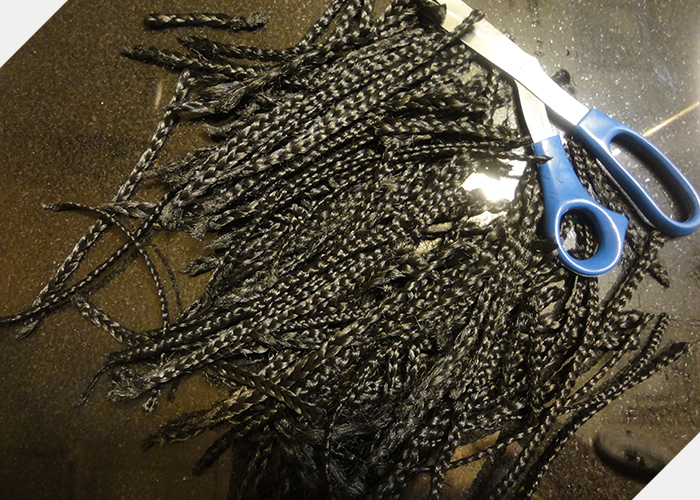 Whilst your braids are still banded, use your towel to remove the excess water. Once they’re about 50% dry, remove your bands and then gently finger detangle if you have loose/feathered ends. About 15 minute’s prior to take down, spritz your braids (focusing mainly on the first few inches) with a water, conditioner (you probably won’t want to waste your favourite conditioner for this) and oil(s). Once you have cut your braids, remove the remaining braids by using your fingers to minimise breakage. To remove the block of dirt, spray your conditioner mix on that top area where the braid first meets your hair, to loosen up the dirt. Take your time and slowly pull the hair apart, little by little to remove the dirt from the hair. Once the dirt is out, detangle that section of the hair right away to avoid tangles. Then follow up with a shampoo and apple cider vinegar rinse (this is optional) to ensure that your hair and scalp are thoroughly cleansed. Oh and of course a deep condition is a must. How do you prepare and maintain your braid/twist extensions? The quickest and easiest way to stretching my natural hair is to use a blow dryer. But a few months ago I was told by Trichologist (hair/scalp specialist) Teresa Angelina that I blow dry my hair too much. In my head I was thinking...she doesn't know about the shrinkage I have to deal with when my hair gets wet. Those with at least 75% shrinkage can relate to my pain. How can I possibly get my hair to stretch to it's full potential without the use of heat? Of course the first thing I did, was jump onto my computer and start to do some research. Thankfully I discovered that i wasn't alone and there are so many different ways to stretching your hair without using your blow dryer. You've got to love the internet. 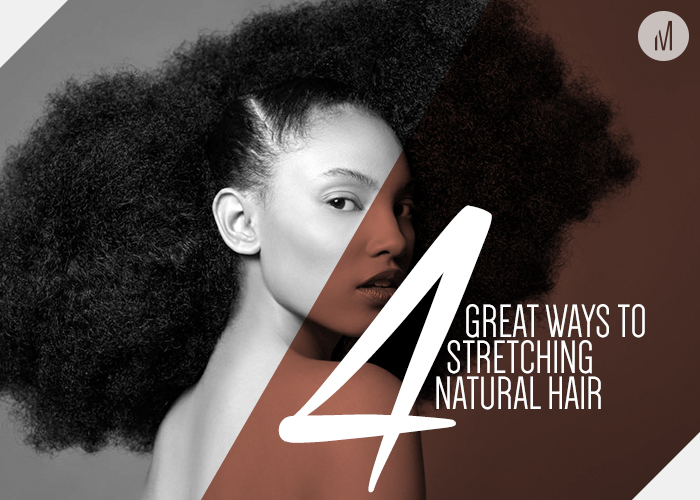 Here are 4 great ways to at least minimise your shrinkage or stretch your hair. Before you shampoo/cowash, put your hair in braids or plaits, as it's a great way to minimise shrinkage and to reduce tangles. Check out the video below which illustrates how this method keeps your hair nicely stretched during the cleansing process. Doing two strand twist or flat twist on wet/damp hair is a great way to stretch out length and prevent shrinkage. Alternatively you could use braids, as they create a little more stretch or tension than twists, giving you a little extra in length. After my hair has been shampooed/cowashed and then towel dried with my microfiber towel. I then spray my Creme of Nature argan oil leave in conditioner throughout my hair. I then section my hair into 8 sections (4 on each side of my head) and complete my LCO (Liquid, Cream and Oil) method. Liquid - Creme of Nature Argan oil leave in conditioner (which has already been applied). Cream - Giovanni Direct Leave-In Conditioner or a oil moisturiser. Oil - Coconut/Jojoba/Olive/Argan/Grapseed oil to seal it all in. Each section is braided and then I create bantu knot at the ends to ensure maximum length and to prevent dryness. Once my hair is dry, I take down the twists, detangle and then do two large braids (one each side of my head) to give it one last stretch overnight. The following video is very similar to the regime that I follow. It's also great for those transitioning. At the moment Curlformers are a very popular heatless natural hair stretcher and you can stretch out hair of any length with this set. But sets like straw set, roller set, flexirod set etc generally stretch natural hair. The following video shows you how to stretch short natural hair using Curlformers. Banding is the process of using ponytail holders to gently stretch out wet natural hair. The hair is divided into sections then the holders are wound tightly down the section from root to tip so that the hair stays stretched as it dries. If you're going to try this method, be sure to use elastics bands made without the metal piece that can snag your strands.